This entry was posted in climate, greenland, SciBlogs, science, Science and Society and tagged climate change, global warming, SciBlogs. Bookmark the permalink. It is very topical and very important. Easily the most important issue mankind has ever faced. It maybe the last as well. You might think me a luddite for even questioning, but I’m still reading to figure out where I sit with man-made climate change. I put the above Youtube out to the skeptic community, and they came back with the below link in refutation of the claims in this clip … wondering if you care to comment on it? Mark Hubbard doesn’t know whether he should put more weight on climate science conclusions made by leading climate scientists or from a conspiracy-theory blog site. Would love to hear from someone the scientific rebuttal based on facts. I am keen to know where the truth lies. Mark, that blog page does not link to their source. However, the figure they use take just 2 points over 6 years so it looks like an extreme case of cherry-picking. That seems to happen a lot with wishing to discredit the climate change science on arctic ice. In short, have a look at the data over a long term period and evaluate the trends. Be very waryof people who use just 2 data points, and refuse to provide a citation. You can see how taking just 2 data points gives the wrong message. Mark the so-called “skeptic camp” may well use the argument. it is yup to the reader not to takes such motivated “evidence” on trust, though. You can see from just this one example how this camp distorts the data – and that happens again and again. You either put in the time to work things out for yourself (and not everyone has the time or interest to do that) or you put your trust ion the real experts, not denier blogs. If you end up trusting such people of course you are going to be wrong. See, Richard, there’s the problem. It’s called ad hominem. It’s infantile, it’s irrational, it gets us nowhere. Mark Hubbard, don’t use words you don’t know the meaning of. My comment was an accurate observation. You linked to a conspiracy theory blogsite that presents a no source meaningless graphic and used it to question conclusions from an eminent climate scientist, and, by association, the global scientific consensus on climate change. You didn’t like my observation. A slow hand-clap for you. Peter Wadhams is a known alarmist. It’s worth pointing out that Wadham’s views on the fate of the sea ice and the seabed methane “emergency” are considered to be out on the fringe by his peers in the Arctic science community. That doesn’t mean he’s wrong to be concerned, just that informed opinion considers the rapid retreat of the sea ice (and rapid melt of Greenland) to bad enough without having to overstate the case. That’s all very well Gareth but Wadham’s comments in regard to risk analysis might bring the wisdom of not “having to overstate the case” into question. Further, Wadhams is calling for research into how much methane is locked up and how fast it might be released. Given the worst case scenario, that call for information cannot be regarded as being alarmist or fringe. Followed by three links to junk science denier and conspiracy websites, one even trying to ride on the name of the IPCC. The “CO2 drives climate” hypothesis – causing warming which produces a catastrophic climate condition or net disease state – predicted that BOTH the Arctic and Antarctic areas would lose sea ice via “Polar amplification” – with increasing CO2 acting in like manner in both Polar areas. But the Antarctic has slowly increased its sea ice extent over ~the same time period measured for the Arctic’s decrease*. Therefore, the whole prediction itself is wrong, regardless of what the Arctic does….as are ALL of the “CO2-Climate Change” predictions: “the science”, as they call it and which they think must work in the real world “because CO2 is a greenhouse gas”, hasn’t got a prediction right yet! Therefore the hypotheses claiming “CO2 drives climate” are Scientifically Falsified. In other words, “mainstream” Climate Science has been unable to find any of its predicted empirical effects from an increasing CO2 concentration which have then occurred in the real world. Therefore there is something seriously wrong with “the science” of mainstream Climate Scientists. Goodness me. Last post, because I can’t debate with people like Richard: that attitude is toxic. But a funny thing Richard; I have, merely, a healthy scepticism regarding all matters re climate (and this mainly because the scientists did not help their cause by originally manipulating their figures in the opening ambit: that was the real damage here, as they politicised the science). I have an equivalent scepticism, as you do following your name-link, on many aspects of our political and legal system. Like you I think Peter Ellis has to be exonerated and compensated. (My piece that mentions Ellis is here: http://lifebehindtheirondrape.blogspot.co.nz/2015/01/retrieving-roger-suttons-corpse-from_22.html ) The portion on Peter Ellis starts about half way down that piece, at the heading with his name in it. I am trying to understand the science around climate in mind of that original manipulation raising questions of ‘alarmist panic’, every bit as valid as the nonsensical ‘moral panic’ you note around the Ellis case. With that, great blog Ken. I won’t stick around on this thread anymore to inflame a senseless ego war. No Mark, forget the blah blah excuses/diversions and face what you did. You can’t even interpret the meaningless graphic you linked to. Dispute that? well go on then, tell us what does it mean and why? Here’s a tip. Learn some critical thinking skills, examine your sources and earn how fact check. Mark, your retreat after making unsupported claims of fraud is hardly honest. Please support your claim that scientists did not help their cause by “manipulating their figures in the opening ambit.” Manipulation of data is scientific fraud which is strongly condemned in the scientific world. The deniers may get away with it but scientists usually lose their jobs for this and become unemployable. Is this of the same level as the image you posted relying on 2 data points? You really should not retreat after among such charges. Seems to me that while you claim to be open-minded or undecided in this climate issue you are uncritically buying into, and repeating, propaganda produced by deniers. Jesus you guys: must you demonise everyone you ‘think’ doesn’t agree with you? Read my first linked piece above on what I think of this BS. I am undecided. Your and Richard’s attitude, however, puts me ’emotionally’ with the deniers out of pure pigheadedness (not science). So what do you hope to achieve with that? I hope Richard holds no public position or power over people, because, to repeat myself, he a cynical, toxic tyrant in his bearing, who must belittle those who don’t agree wholeheartedly with his every word. I have no expertise in climate science – never said I did (let’s debate philosophy, politics, or economics some time.) On my own blog I have only two posts that even broach it. I found the Youtube clip compelling, so I asked the question of the sceptic community and brought that back here to see the rebuttal and if I agreed with it. Because this is an important debate. Though I wasn’t trying to even start a debate, here: just how easily it could be defended. You replied, Ken, with your own graph, and I largely accepted your point. At that point, there was no need for me to carry on. That is to make the ‘withdrawing ice’ argument work you have to start your graphs at 1979, but you get a differing interpretation if you start earlier at 1974. I remain on the fence (perhaps tilted slightly to ‘your’ argument, intellectually, but hating the way you go about it.). So, whatever the Truth is, with this inquisitorial zeal of your post above, giving me a position I don’t even hold, then using that to call me dishonest … with that attitude you can go to hell. I’m gone. Mark, you made an unsupported claim of scientific fraud. That is a serious claim and I have asked you to back it up. Now you reply without even referring to it! If you refuse to stand by your claim of scientists manipulating their figures then why not apologise and withdraw it? If you do stand by it then provide some evidence – don’t leave it as a statement we should all assume. It isn’t. You claim to be sitting on some sort of fence – if that is so then surely claims of scientific fraud are not warranted. Especially as you also claim to have no expertise in that subject. As a scientist I welcome critical assessment of the science. But slanderous claims of fraud without any evidence really do make me angry. It makes rational discussion impossible. And it doesn’t help for you to pretend you have not been slanderous by accusing me of “inquisitorial zeal” when I request you back up a serious charge with some evidence. That is simply avoidance and refusing to face up to the need to support such claims. It’s pretty simple – just provide evidence for your claim. I welcome evidence, it’s unsupported slander I object to. Are we reading the same comments? But evidence? You have the data (I’m not the scientist): post the graph you put up above, but with data points starting at least at 1974, or better, 1970. Let’s have a look at that, and let’s start with that. If it shows similar downward trend, the ‘science’ is right (and I hope it would be). Mark, you avoid the elephant in the room. :-). Mark, it’s your appalling methodology that’s on display here. You “put” it out to the “skeptic community”? by using tweeting Ken’s blog post? Who is the “skeptic community”? they came back with the below link in refutation of the claims in this clip … wondering if you care to comment on it? Who provided the link to a meaningless graphic on a conspiracy kook’s website. How about answering these questions and then explain why you thought it proper to propagate to the world the drivel fed to you. Sorry I don’t know how to make that viewable in here. My observations on the graph. 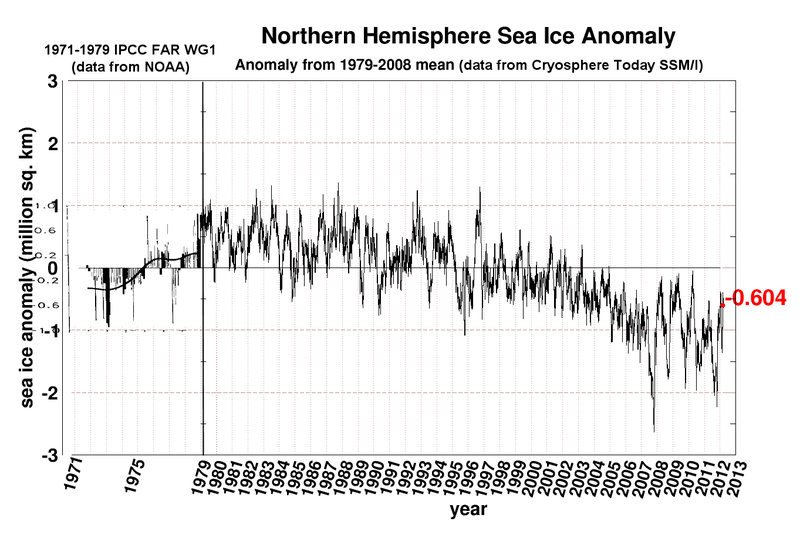 1971 to 1979 – data per NOAA – are lower, thus starting the graph at 1979 gives the most dramatic fall in ice volume? Agreed? 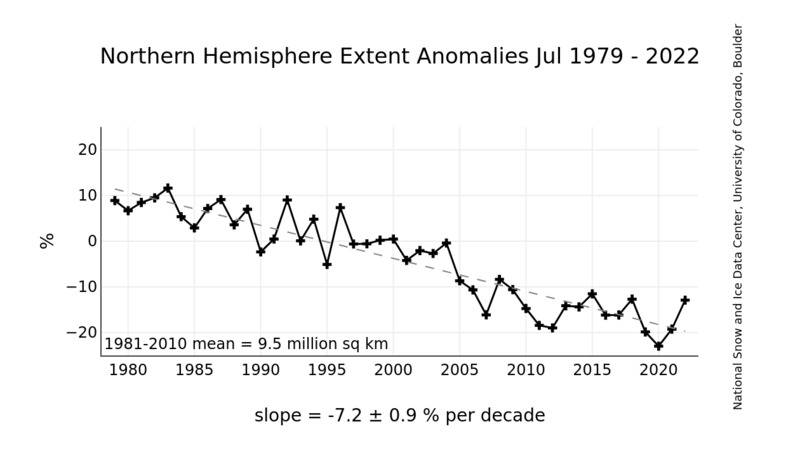 There would still be a downward slope, however, much more gradual, from 1971, plus, the ice volume from 2008 appears to be at least constant, if not increasing … only future data will show where that ends. Agreed? So, I can argue both sides of this clip from the longer data series. ? Although the salient point for this thread, as it’s ended up, remains is some sub-set of scientists trying to promote a ‘science-as-decided’ via an unrepresentative slope by means of beginning the graph they use from 1979? Mark, are you attempting to ignore the criticisms of you slanderous comments? some sub-set of scientists trying to promote a ‘science-as-decided’ via an unrepresentative slope by means of beginning the graph they use from 1979? Oh, so you are a “science is unsettled” crossed with a “there is a conspiracy” troll. Here was me thinking you were a concern troll, my mistake. And you go straight to the world’s most notorious climate science denial website. You don’t even appear to appreciate the difference between volume and extent (area). Notice how neither of your comments connected with the ‘science’ I put up in the form of that graph and conclusions on it. I have no idea (truly I don’t) Ken, what you’re on about with my need to retract this or that, ie, my heresy in your eyes – I hate that BS, okay. Gets us nowhere. The graph and my conclusions, let’s stick to that, not the crap. So, I can argue both sides of this clip from the longer data series. Comment to just the points of science, please. Richard, your final sentence when I take out all the noise of your cynicism seems relevant: the difference between volume and extent – are you referring to a differing basis for the NOAA data? Is ice volume versus the extent of ice coverage quantifiable meaningfully for the purpose of this question? Mark has been accusing honest scientist of manipulating data and now makes a song and dance of something he has found on a climate denial site to imply scientists are suppressing early ice coverage data. Yet a few hours ago he was happily promoting a graphic relying on 2 data points! Two data points! Yet he is very careful not to accuse his mates who provided him with the graphic of manipulating data! And he would not doubt take offence if I suggested it! No, Mark. You did not confine your comments to the science. You made an assertion that honest scientists were manipulating data. Your refusing to face up to that now is just cowardly and dishonest. A better man would either withdraw and apologise or would provide support for the claim. Your integrity is blown away by your refusing to face up to your claim, your pretending it didn’t happen when it is clearly in front of you. That is not the way to participate in a scientific discussion. An hour ago you were happy to accept 2 data points. Now you want pre 1979 data and are implying it is suppressed. My advice is get off you bum and do some work for yourself. Go to the original data sources and articles instead of expecting others to do this for you. Don’t rely on climate change denial sites as this only leads you to be fooled by a 2 data point set and claims of manipulating of data by honest scientists. Always go to the evidence. Your comment on the graph of my above post Ken: what are your considered comments on it, given how that graph, and the implications it has, change on the longer data set..
Or do you only intend to crucify me in the church of Ken? The graph please. How am I wrong? Um, re your last comment (Ken) are you saying that pre-1979 dataset showing ex NOAA is not legitimate (or are you saying not appropriate?). Perhaps you’re right, so okay, why is it not legitimate or appropriate? Or if it is, again, how are my conclusions from the graph of the longer data range wrong? I am saying Mark, you should look for the original data and articles – not rely on a climate change denial website well known for manipulating and misrepresenting data. I, myself, have not looked at the data you refer to – and if I do it won’t be at Wattsup. Only a bigot would assume without looking at the data that it has been manipulated to deceive. Are you asking me to do your work for you? I question your claim of wanting a spirit of inquiry – an inquirer does not slander honest scientists without evidence. If I have taken you out of context – then I apologise and withdraw. But I do not believe I have – but, as always, I am open to your explanation. I asked a question. That was my only sin. That questioning spirit born of the Enlightenment at the heart of modern science (once). The dataset of the second graph would appear to be intact, in that it records all years. You denigrate the source, so we are at the impasse that the climate debate itself seems at. And this thread is a perfect example of how the the climate debate will never resolve itself because neither side seems able to interpret data without agenda. This thread also serves as example at how ‘your’ camp operates. And I don’t like it at all. It attempts only to bully, belittle and silence. Area is not the same as volume. You’ve post a graph of ice extent and refer to it as ice volume. Volume and extent have a whole different set of physical drivers and consequences. The WUWT graph is a cut and paste job. Hasn’t it not occurred to you that there may be reasons the two data sets have not been presented on the same graph by IPCC and NOAA? Reasons apart from it being a conspiracy to deceive as suggested on WUWT? Naahh, Mark just swallows it whole. You’ve avoided answering @1.10pm and 2.39pm. Sorry Mark, I have been attempting to comment for a while now and had computer problems. I will do this in several takes to avoid losing stuff again. This figure is a combination of satellite records, shipping records, and ice charts from several countries. It is only since 1979 that satellites have provided a continuous, nearly complete record of Earth’s sea ice. That is why figures commonly cover the post-1979 period to avoid comparing oranges and apples. A simple hunt of on-line articles and data would have provided you with this information – please stop relying on climate change denial web sites well known for data manipulation and distortion – as has been done for you in this example. Now, Mark – your questions, comments and criticisms are welcome here. But you will always be asked for supporting evidence for your claims (and I will always apologise and withdraw if I am shown to be wrong). However, you claim that honest scientists were manipulating data was unsupported. You refused to provide evidence when asked. I do not see that as honest and such ad hominem attacks are unwelcome. It is hardly honest to behave in that manner. Even worse to accuse me of paranoia. I assure you that questioning is very much involved in modern science – and your suggestion it isn’t says more about you than it does about science. Mark, you may not like it when reprimanded for a slanderous, unsupported, comment. But that anger of mine comes very much from a commitment to evidence, the real content of science. Accusation of scientific fraud is extremely serious so such slander always angers me when it is unsupported. You are unhappy for me to denigrate a source known to dishonestly manipulate and distort data (as they did with your graph) – yet it seems that when you are asked to back up a serious charge like this you see it as being “belittled, bullied and silenced.” That is pathetic. Now, I have done the work you could have done for yourself (if you didn’t think that stopping at Wattsup was sufficient) You can now see that the use of data since 1979 in commonly used graphs is completely normal and warranted. it would be dishonest to claim this as manipulation – completely dishonest. And this thread is a perfect example of how the the climate debate will never resolve itself because neither side seems able to interpret data without agenda. In reality, Mark, from this comment it appears that you haven’t taken a thing on board from your visit here. Nothing about your poor methodology and gullibility. Think about it next time, before you “put it to the skeptic community” and repeat their nonsense on a blog that puts weight what the scientific community reports. Go to NOAA, go to NASA, read what the IPCC has to say. Don’t swallow obvious crap from conspiracy theorists. Ken, cheers for the considered latter comments. I’ll have a good look tonight – letting my eyes slip around the snide parts. Skimming the more comprehensive data looks significant, yes, I agree. It goes without saying Richard can go to hell. Paraphrasing what Yanus Varoufakis said yesterday: I wear my critics’ loathing with pride. A: Skimming the more comprehensive data looks significant, yes, I agree. K: do I interpret “I’ll have a good look tonight” as meaning you have to get back to your climate change denial mates to find an answer? And haven’t we seen that pattern before, over and over? Trevor, Andy and all the no-names. They exhibit no shame at being repeatedly taken in. Mark has been lied to and led by the nose. Will he go straight back to the same manipulators and swallow some more?